We should have started months ago and the sale was coming up Saturday morning. So many tubes, so little time. Jim was talking to Deb’s father about the huge number of vacuum tubes in the basement. Deb’s father liked the idea of taking tubes for sale at a local ham fest. How does one go through over a thousand glass and metal electronic tubes and get them ready for sale? We started with a look at some web sites showing retail and wholesale prices for certain tubes. Pop’s collection included many of these desirable tubes. His business was building, evaluating, and maintaining sound systems and he had a lot of audio tubes. We knew where to start sorting and trying to make sense of so many pieces in the shop. Jim set up a couple of tube testers, really cool old-school test instruments, and started going through the first batch of tubes from the list. Pop and Jim worked side-by-side a few evenings sorting, testing, cleaning, and re-boxing the good tubes. Ninety percent of the tubes were good, a credit to Pop keeping up with his stuff back in the day. Many of the tubes, despite their age, are in high demand for guitar amplifiers, stereo amplifiers, and ham radio amplifiers. Pop and Jim would spend hours working each day, sometimes together and sometimes singly, through the piles of tubes to cull the poor ones and shine the good ones. By Saturday morning they had gathered two full tube caddies (wood boxes with fold-open sections for carrying and organizing tubes) and several cardboard trays and boxes full. The offering for a ham fest comprised several hundred vacuum tubes with manufacture dates over the past four decades. We weren’t sure how to price the tubes for sale. Our goal was to find a new home for the tubes without giving them away. We couldn’t readily find valid comparables for this inventory of tubes. The inventory is older stock than many people still have. And without calibrated tube test equipment we weren’t confident we could compare these tubes to what we found offered elsewhere. The value of something can be determined by what someone will pay for it. 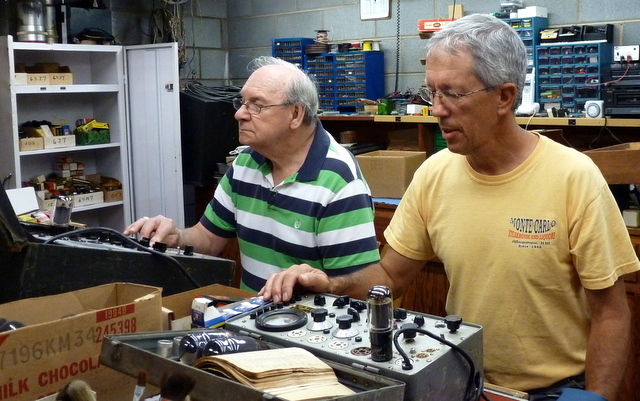 Pop and Jim took the tested inventory to the Shelby Hamfest Saturday morning. Great thanks to the Dixie Rebels Contest Club for sharing their flea market space with us. Pop and Jim opened the car trunk and before they could get the tube caddies from the trunk several interested customers were trying to sift through the tubes. We didn’t realize the anticipation caused by our casual announcement two weeks ago of tubes for sale we would bring. Jim insisted on putting the tube caddies onto the nearby tables along with trays of tubes he and Pop had brought. Undeterred, the customers were examining the tubes and asking questions about provenance and condition. One fellow who had driven up from Rock Hill SC decided within five minutes to offer to purchase the entire lot of tubes. Pop and the man agreed on a price, the buyer made a down payment, and promised to return quickly with his car. Jim and Pop had expected to spend all day Saturday and possibly some part of Sunday morning at the hamfest showing off the tubes. They instead packed their tables into the car by 08:30 a.m. and had time to wander the show two hours and still get home in time for lunch. The tubes sale paid for parking, two ham fest tickets, rental of a flea market space to show the tubes, a few gallons of gas to get there and back, and had cash left over. This worked out great. We found the tubes had plenty of value to someone and generated a lot of interest among many other shoppers in the very brief exposure. What’s next? Ideally we find someone who will come to the house and take the remaining inventory and test instruments and assorted gear without our sorting, cleaning, boxing, pricing, and showing. More likely we will be going through the processes again and looking for motivated buyers. It’s a win-win deal — we organize and clean shop space and someone else finds purpose for these things. It all works if we test tubes and find buyers.